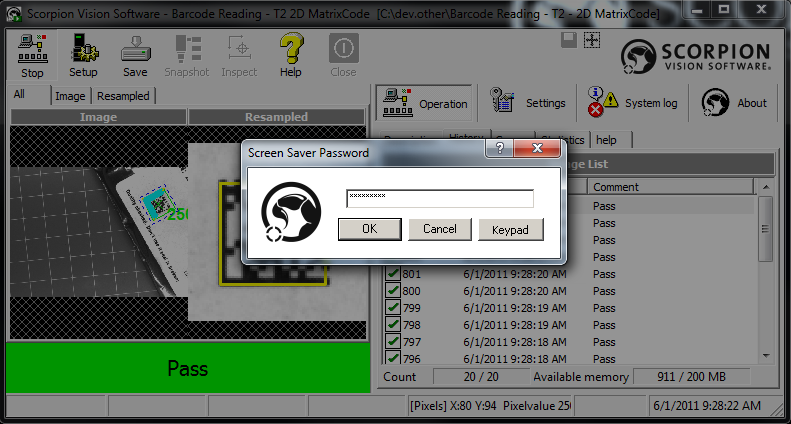 Scorpion Vision Software transparent screen saver with password locking is used for user input (keyboard/mouse) disabling. In Windows Screen Saver Settings dialog select Scorpion Vision Software in dropdown list (see image below). Windows XP: right click on desktop and select Properties->Screen Saver. Windows 7: right click on desktop and select Personalize->Screen Saver. Configure screen saver settings (setup password and/or transparency). NOTE: If error window appears with message like "The application failed to initialize properly (0xc0000135). Click on OK to terminate the application." - check if Microsoft .NET Framework 2.0 is installed properly. In Windows Screen Saver Settings dialog (image above) click Settings... button. 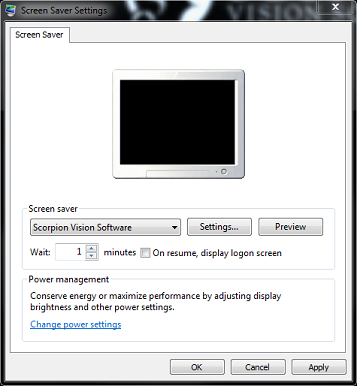 Scorpion Vision Software screen saver settings dialog will appear (image below). Unlock Password - screen saver closing password (default 911). Opacity (%) - controls screen saver transparency. Copyright © 2000 - 2017 Tordivel AS.